Ensure your heater and air conditioning unit is working properly with our professional HVAC contractor services in West Columbia, SC. Whether winter is around the corner or you’re in the dead heat of a warm summer, you’ll want to make sure your home is a safe haven from extreme temperatures. If your HVAC isn’t up to speed, then you need to call on Mack Heating & Cooling. Expect nothing less than the best from our team. When you give us a call, our trained professionals come to your home or business and provide a full inspection of your HVAC unit. Every member of our team is qualified to repair, maintain, or even install a broad array of heating and air conditioning products. We’ll never start work without your approval and you’ll be given all the information you need to make a smart decision for your home. 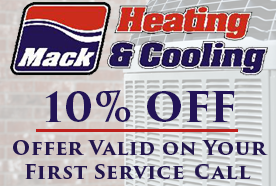 Turn to Mack Heating & Cooling for the best in HVAC repair. We put our many years of experience to good use in diagnosing and repairing heating and cooling units. With service rates that won’t break the bank, you’ll never have to put off having your heating repaired before winter hits. Additionally, we can repair parts that are still under warranty so that you don’t have to wait on the manufacturer. Stay up to date with the latest in central heating and cooling technology with our extensive list of heating and air conditioning products. Our team is qualified to service and install many different types of HVAC equipment, including thermostats, specialty filters, and dehumidifiers. Contact our HVAC contractor now to get an estimate, or have your home or business serviced today. Machinery can malfunction at any time. When these unpredictable dilemmas occur, we offer emergency AC and heating repairs. There is no situation too big or small for us. Our staff is equipped with the knowledge and expertise to provide you with the solutions you need. We understand you have many choices when it comes to choosing a company for AC duct repairs. That’s why we appreciate you taking the time to get to know us. For more than 30 years, our community has depended on us for all their HVAC needs, from repairing AC units to water heater installation. With our experience at your disposal, you can count on us for the most effective service. Learn about Mack Heating & Cooling, Inc.
Mack Heating & Cooling, Inc., in West Columbia, SC, is an HVAC contractor providing cutting-edge technology for the Midlands area. Our locally owned company offers a wide range of heating and air conditioning products and services for residential and commercial customers. With more than 25 years of experience in AC and heating services, we ensure our customers receive top-notch service from AC replacements to furnace repair. Our goal is to build our reputation, not to rest on it. For this reason, a commitment to excellence is just the way we do business. Learn More about Mack Heating & Cooling, Inc. Contact us to find out more about our HVAC contractor services. We proudly serve customers in West Columbia, South Carolina, and the surrounding areas.